Victor M. Carrión has a BA in Psychology from Columbia University, NYC. In addition, he is a recipient of a certificate in writing from Columbia University School of Writing as well as NYU and UNM. He is passionate about writing and has been telling tales since he was a child. He has several completed movie scripts, which he intends to turn into novels. It has been an experience of a lifetime working on Jake Falcón Spirit Hunter with his brother, Felix Carrión PHD the illustrator. Jake Falcón: Spirit Hunter is a paranormal graphic novel written by Victor M. Carrión and illustrated by Felix Carrión. Jake lived fast and loose. He was brutal in business and blithely disregarded the thoughts and feelings of those he came in contact with. When his embezzlement scheme went south, he left his partner holding the bag for it. Granted, he didn’t expect the man to throw himself out of a window and crash-land on a car, but he argued to himself that no one forced Lawrence to do it. Jake forestalled Police Detective Jennie Davis’ questions, promising to come into the precinct the next day, but he never did make it there. The accident he was in while driving late that night had somewhat permanent repercussions. Jake didn’t feel dead, but all the protestations he made to the police officer who arrived on the accident scene fell on deaf ears. He seemed to be out of body and was horrified to see himself still at the wheel, unmoving -- and there was nothing he could do to make that body in the front seat return to the living. In the days to come, he became a Spirit Hunter, an unwilling resident of a dark and tormented middle plane where he’d stay until he found redemption. Victor M. Carrión’s paranormal graphic novel, Jake Falcón: Spirit Hunter, is a dark and gritty tale filled with harsh images, looming demons and a tortured anti-hero the reader can’t help but alternately despise and admire. Felix Carrión’s black and white illustrations masterfully reflect the dark visions of the story; each panel is evocative and profound, adding motion, pathos and a masterful collection of human expressions. I loved the flashback that Victor Carrión includes which gives some insights to the man Jake becomes, and the scenes which take place in the sanctuary for his fellow souls in transition are moving and powerful. I’m hoping the Carrións produce a sequel to this engrossing and original graphic novel. 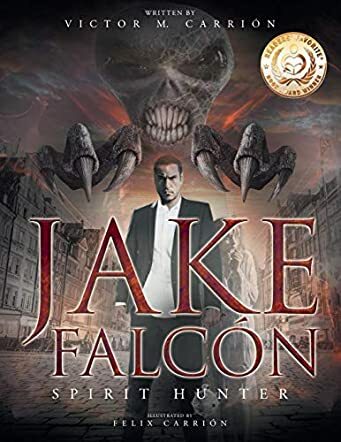 Jake Falcón: Spirit Hunter is most highly recommended. Jake Falcón Spirit Hunter by Victor M. Carrión is an exciting graphic novel about a man named Jake Falcón. One day, Jake dies in a car crash, and his spirit winds up in a terrifying world full of demons trying to devour as many spirits as they can. Jake must fight to save others' souls as well as his own. He had been chosen to be a spirit hunter. At first, Jake doesn't understand what that means. He still doesn't accept his death, and is in denial. Although Jake is reluctant to fight demons, he eventually saves the spirit of a young girl from their clutches, and delivers her soul to the light. Eventually he meets other spirit hunters, and they help to explain more. Will Jake accept the fact that he's a spirit hunter? I enjoyed reading Jake Falcón Spirit Hunter by Victor M. Carrión. The book has many exciting scenes that are filled with action, leaving the reader wanting to know what happens next. I was hooked by the first page and I didn't want to put the book down. This is a real page turner and will keep the reader on the edge of their seat. The pictures by Felix Carrión are very well drawn and clearly depict each scene. Every image is full of action and suspense. I liked the ending of the book, because it ends on a cliffhanger and leaves the reader wondering what will happen after the book finishes. I would recommend this book to everyone who enjoys this genre. I am a big fan of graphic novels and comics. I think they inspire a love of reading in kids. When they are done well, they are as educational as anything you can find at a public school. When they are done very well, they generate a thirst for knowledge that lasts a lifetime. That is one reason why blockbuster superhero themed movies are so popular now. The technology to make these movies as beautiful and colorful as a comic book or graphic novel is finally here. Jake Falcón: Spirit Hunter is really not a graphic novel for kids. But if a teen or even a pre-teen picks it up, it will make him think. He will learn something. He will start to observe and question things more. I like this story by Victor M. Carrión. It is about a real man living a regular crappy life. Illustrator Felix Carrión does a great job bringing this story to life. The layout and art in Jake Falcón: Spirit Hunter is great. Graphic novels can be confusing sometimes when artists try to get too fancy and play with the order in which they tell the story. Jake Falcón avoids this problem with easy to follow sequences that the reader can easily follow. This is an adult tale, but anyone can read this story and understand Jake’s life and what is happening to him. It is a moral story, a tale of good and evil. But Jake, like most of us, falls somewhere in the middle, and must work his way to the light by helping others get to the light. A powerful story with powerful art. A great job.